Contrast refers to the amount of difference you see between two colors. "High contrast" usually refers to great difference in two colors' value. In other words, one is very light and the other is very dark. High value contrast: The lightest colors in this image, on the illuminated part of the pear, are almost white. The darkest parts of the image are almost black. In order to look your best, it's important for you to identify the level of contrast that exists in the colors of your own body, and then repeat that level of contrast in what you wear. This black and white photo of Sophie Ellis-Bextor, a Bright Winter, shows that her natural level of contrast is very high. Her dark colors appear very dark and her light colors appear very light. To look her best, Sophie needs to wear high-contrast combinations. The outfit below works as a high-contrast look because all of the exposed pale skin serves as the light color contrasting with the black of the dress. Don't assume that dark hair alone = high contrast. 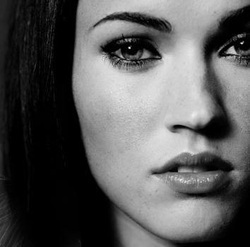 Brunette Megan Fox is high-contrast in part because her fair skin is particularly smooth and luminous. The light it reflects causes it to contrast highly with her darker colors. 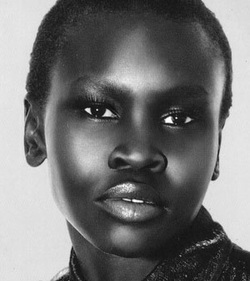 Supermodel Alek Wek. 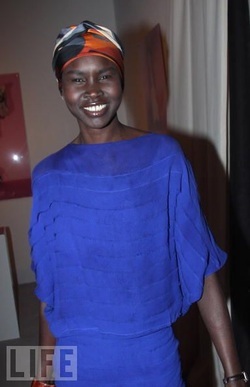 Notice how the whites of her eyes and the reflected light on her face appear extremely light, contrasting highly with her beautifully dark skin. Angelina Jolie, meanwhile, is a person of naturally low contrast. In a black-and-white photo, her light colors aren't light enough to appear white and her dark colors aren't dark enough to appear black. Compared to the b&w photo of Sophie above, this photo looks less extreme and more blended. Angelina is most beautiful in low-contrast looks. Here, her skin, hair, top, and the photo's background all seem to blend together, and she looks fantastic. Two highly contrasting colors might also be different in hue. That would mean that the two colors are far apart on the color spectrum. Remeber ROY G BIV? Red is far from blue on the color spectrum. Placed next to each other, they create contrast. So people who need high contrast can also create this effect by combining highly contrasting hues. Notice how Alek is balanced by these contrasting colors, not overwhelmed by them. Imagine the same outfits on, say, low-contrast Helen Mirren. Impossible! Holy moly. Fantastic. And you can't truly appreciate the feat Alek is pulling off by working these colors unless you imagine them on a low-contrast person. Could the flawless Angelina do this outfit? Heck no. OK, I'm not crazy about the dress either. But what I want you to notice is the red of the booth. By contrasting with the purple and violet of the dress, it makes the whole photo work. Drape yourself at home! A red or pink, a yellow or gold, a green or blue-green, and a blue or violet from six seasons of your choice. ​​Each cardstock sheet is at least 4 x 8 inches. 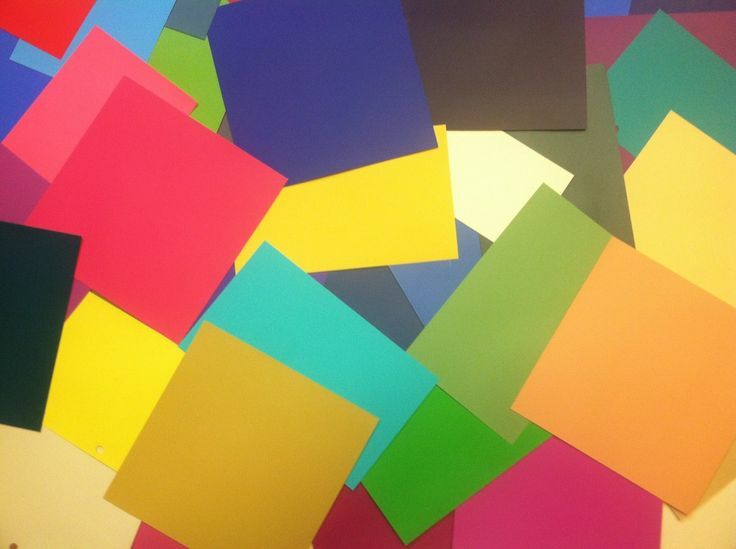 "I received my color cards and I absolutely love them! I was a little unsure about my coloring but seeing the cards, now I'm confident that I picked the right season." from each of the 12 seasons.